The Barefaced Bride Founder, Owner + Operator, Melanie Bowman. Passionate, driven, loyal, kind, optimistic. Fresh after completing a Bachelor of Arts / Communications Degree at University, I decided to delay the jump straight into the Sydney workforce and, still in my early 20s, packed my bags and headed to the UK for the travelling, living and working abroad experience. I’ve always been a visual person and being drawn to the beauty and makeup halls in the London department stores had me working as a consultant in Harrods, Selfridges and Harvey Nichols. It wasn’t long before I realised that earning a minimum wage in London whilst supporting my lust for endless European travel holidays wasn’t going to cut it. I moved on to working in contract roles at the big UK investment banks such as Barclays and Deutsche Bank. After two and a half years, my UK adventure came to an end and I continued working in the corporate finance sector back in Sydney for Macquarie Bank and then Thomson Reuters. I was fortunate to move into more comms / marketing / events roles whilst feeding my creative self as I always felt “stuck” in a corporate culture that was never for me. Unluckily (or luckily for me, whichever way you look at it!) the financial crisis that hit in 2008 saw me being made redundant from more than one position and it was only after getting married and falling pregnant with my first babe that I (with the encouragement of my husband) decided to take the leap and begin a life and career of my choice. I’ve come from a family of male entrepreneurs, with my Dad and Uncle taking over the family business from my Grandfather, who had taken over from his father in the 1920s. My Great-Grandfather created the business - a motor vehicle company that went on to thrive until the 1990s. With that, I’ve always known I would try to create something (or attempt to) on my own, as I could never feel settled working under someone else. 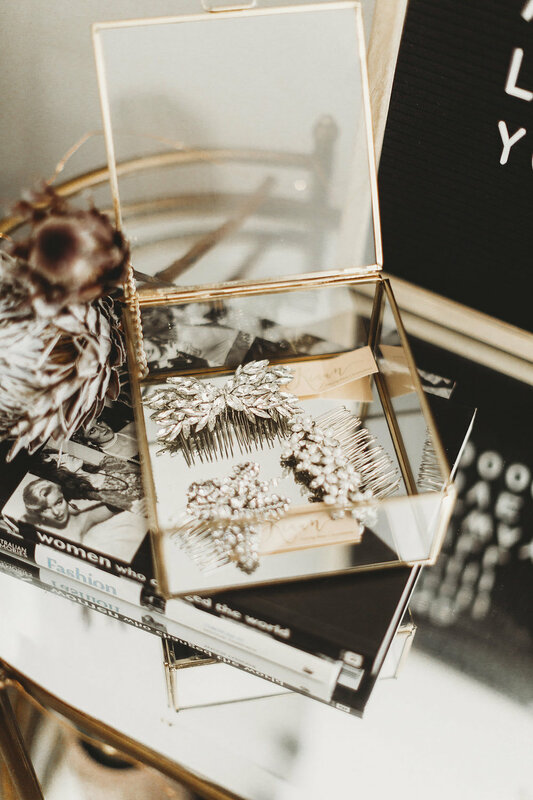 So, after planning every detail of my own wedding, and loving it – I felt drawn to the bridal industry. It was only after purchasing a dress that I then decided not to wear, and then spending a fortune on “the one” that I struggled to find a space to sell it online. I felt what was lacking was an elegant and private location for brides to come and try on lots of different designers in one place. But more importantly, I strongly believed that there was no greater example of waste than an expensive wedding dress - worn for one day, only to be thrown into a box and never seen again. I've made it our mission to provide modern and mindful brides the option of purchasing a dress on the spot and bringing new life and love to a preloved treasure. The Barefaced Bride is a specialised consignment store that provides modern and mindful brides with off-the-rack designer samples, preloved gowns and authentic vintage pieces. I hope to continue to provide brides with a different approach and option to purchasing a wedding gown and by doing so, helping the environment and creating a more sustainable future. Absolutely not, I never had a strong inkling of what it was I wanted to do. I studied at Uni thinking (or hoping) I would end up in advertising, public relations or journalism. I always knew I’d be doing something for myself. It’s funny how the universe has a way of allowing time to place you exactly where you’re meant to be. In that, I wouldn’t be able to run my business today if it wasn’t for the roles and experiences I’ve learnt to get me where I am today. ‘Success’ to me is a funny concept, as everyone values success so differently. I don’t necessarily believe that you arrive at success, rather that it’s fluid; something you’re continually striving or working towards. What keeps you motivated and propels you further towards your goals, both personally and professionally. In saying that, I do feel successful in that I’ve created something that allows me to work and love what I do, but also be a mother, which to me, is my most important role. I think the sky is the limit! I would love to see The Barefaced Bride continue to grow as a recognised and respected brand for brides seeking an affordable off-the-rack designer gown but wanting that luxurious and memorable experience. Equally I would love to see the brand develop and establish itself in the eco-ethical space as it’s something I’m passionate about, and believe that it’s what more people should be focused on – contributing and giving back to others and our environment. The most rewarding moments for me are when our brides have that “aha” moment (yes it does happen!) when finding their dream dress. It makes my day knowing we’ve been responsible for making a bride feel like a million bucks on their special day. And also when we receive the sweetest and kindest notes of thanks from our brides. We have recently moved into a new shopfront (from our humble home-based beginnings) and completed a total reno fit-out of the space. Transforming an old decrepit building (which was once a Doctor’s surgery) into an airy light-filled shop complete with high ceilings, a floral wall-art mural and industrial style galvanized steel racks for hanging our gorgeous gowns. We also share our building with an amazing wedding & events floral duo (Aisle of Eden), complete with a beautician at the back of the building. We’ve created an amazing female business hub which is always alive with positive creative energy. It’s a beautiful space to work and be inspired in. I’m a very impatient person so I generally want things to happen fast, or I get frustrated. For example, there are still elements of the shop I’d like finished properly, however I think it’s like renovating your home – you’re never truly satisfied and there’s always work to do! Looking back, I’ve probably made some hasty or impulsive business decisions which is frustrating. But in all honestly I believe that you can only learn and grow from your mistakes. I’m not really a crier, although I do often feel overwhelmed. Simply due to the workload I put on myself being a business owner and mother of two. The shop fit-out was a huge undertaking that was stressful and time-consuming. A labour of love, with sweat and tears to boot! If it wasn’t for my husband who works in the commercial fit-out industry I don’t think it would have been completed to the high standard it is in (on time and to budget). Absolutely yes. I would say it’s increased over time since starting my business. I think it’s only natural as you mature and grow as a person in your career, and even more so if you create a business. You have more to lose at the end of the day if you don’t build the right foundations. As a business owner, you can’t just check out/have a week off when you are dealing with personal things, how do you keep on keeping on with your business when things get tough? Ensure you have employed a kick-arse team to support you and the business. I really think this is key. Surrounding yourself with like-minded souls who you trust and rely on that can step in and take the reins when you can’t is paramount to ensuring your business stays afloat and succeeds. Not really. There are often times when I’m told by my kids or husband to put my phone down, or step away from the computer and switch off. It’s a fine balance! I’m lucky to have a great support network around me with family who are continually there to encourage me to push myself and the business towards new opportunities. Yes, in the beginning it was definitely an environment I wasn’t used to. Coming from a large team / corporate working culture and then becoming a business owner was a totally new concept for me so learning to adapt to that was isolating at times. However, that was 6 years ago and being an established business now has meant I’ve had the opportunity to work with some talented creatives in the industry who are part of my tight network and who I also consider close friends. There have been more sleepless nights since opening the shop. From whether we’d get it completed in time to now having the responsibility of rent with greater overheads. However, there are no big rewards without first taking big risks! Probably nothing! I believe you need to make mistakes in order to grow and learn life’s lessons. I think that ignorance can be bliss in the sense that I didn’t really have any prior knowledge of the bridal industry before I started my business. Given the competitive nature of the industry this may have held me back if I knew then what I know now. Don’t over think it! It’s a big badass world out there and it’s not meant to be easy. Work hard. Stay in your lane and try not to compare yourself (or your journey) to others. Continue to chase your dreams and pursue your passions and life will lead you to where you’re meant to be. I believe in the power of positivity! I try to surround myself with like-minded humans who are motivated and optimistic and who have a clear vision of what they want to achieve. People that light you up and help make you shine, not bring you down. Work life balance; does it exist? How do you maintain it, or a sense of it? That’s a tough one. I’d like to say it can, however it depends on what day you ask me! It’s something I’m always working on. I prefer to focus on living in the moment day-to-day with my children and I try to switch off after work hours so my kids and husband get my full attention. I value my down time like making a homemade cooked meal, story time with my kids and bedtime cuddles. Have you ever thought about giving up? If so, does that feeling hit from the same triggers? Never! Failure isn’t an option. That as a business owner you have lots of time for yourself and flexibility. As mother who is often on school/day-care hours it’s more about me fitting into my children’s schedules and setting work boundaries around that. Surrounding myself with beautiful gowns, working on fun photo shoots and helping our lovely brides is a perk that I’m always grateful for. That you need a can-do attitude and be prepared to work relentlessly to achieve what you want. As cliché as it sounds, you need to stay true to yourself, your values and your why. Only this will set you apart from your competitors. Hell yes! Our whole business model is different from most other boutiques in the bridal industry. We are consignment based, which means most of the gowns we offer have been consigned by brides wanting to recoup some cash after their wedding day. 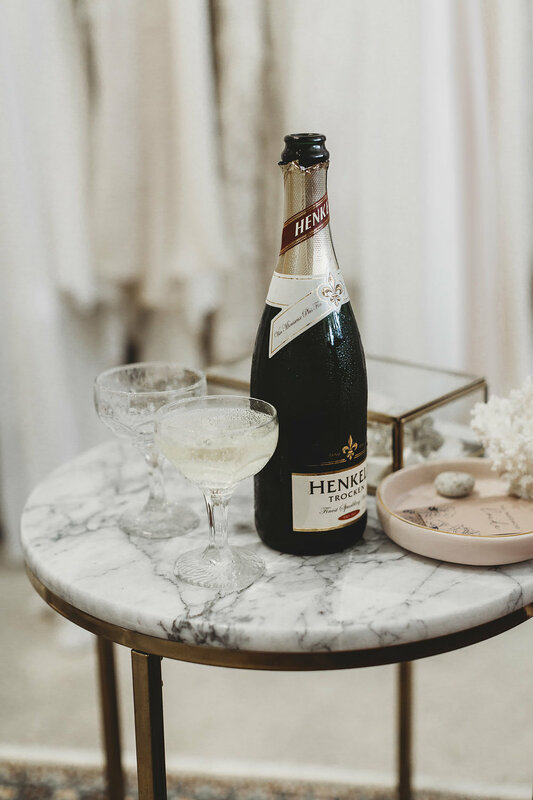 We primarily sell off-the-rack (sample, preloved and vintage) to modern brides on a budget, short time-frame, who are eco-ethically conscious or who simply want to enjoy the experience in a private stress-free elegant space. While there has always been a stigma attached to “second hand” clothing, having a preloved wedding gown takes it that step further. I’ve tried to carve out a niche market in a competitive industry by disrupting the traditional practice of buying a new wedding dress sometimes 12 months out before the day. I hope our brand values can shine a light on eco-ethical weddings in general. There is a huge shift happening right now towards being more aware as consumers of the social and economical impact we’re having on the world. I feel like it has only been in recent years that there’s been a real shift in the bridal industry for brides to be bold and reflect their unique personal style. Moving away from traditional style weddings with couples staying true to their values and not being dictated by the current “trend”. Our focus is on acquiring beautifully designed and constructed gowns while providing our brides a memorable unique experience and a variety of choice all in one location. We want to make brides look good, feel good and do good – and that’s what I want our legacy to be. Because when strong women come together, anything can happen! It’s important because women are important. History shows us that it’s been a man’s world. Times are changing and we each have our own relevant story to tell. The Samantha Wills Foundation is a great platform for this as it inspires others to believe anything is possible.